According to the Bureau of Transportation Statistics 45 percent of daily car trips are taken for shopping or errands, 15 percent for getting to work and back, and 27 percent for social and recreation activities. When these activities are done on a bicycle, at least two of the categories are usually combined in order to minimize back and forth efforts. Whether it's shopping or commuting to work, we always have the need to carry things. 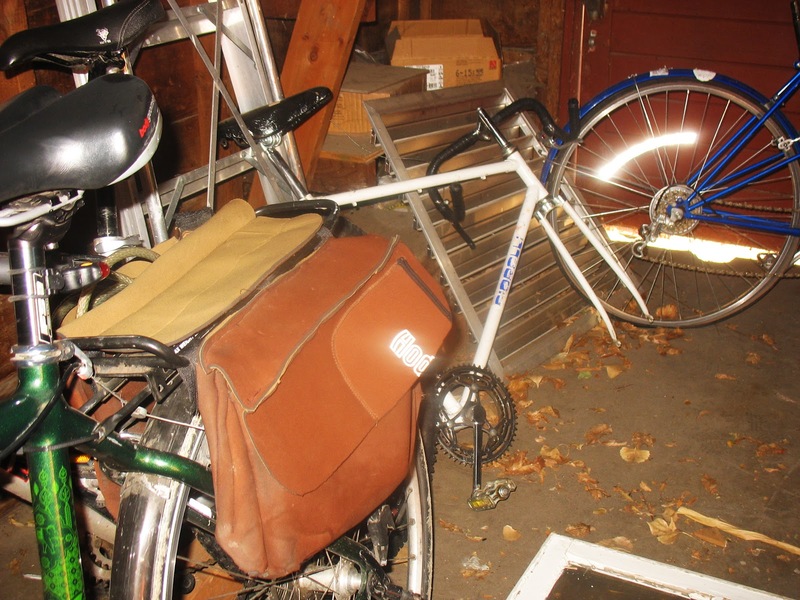 Not everyone can, or even wants to spend their money on expensive bicycle panniers or trailers, but there are plenty of other options to assist you with utility cycling on a budget. 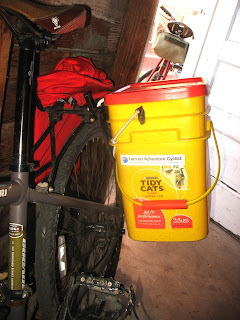 Rita has a nice pair of 100 % water proof kitty litter panniers that she made for around $15, here is a good instruction set on how to make them. If you have even intermediate sewing skills and access to a sewing machine, the sky is the limit for making various bags and panniers for your bike. I made the above medium sized panniers out of an old pair of Hodgman neoprene waders with heavy duty Velcro to attach it to the rack. Total time, about 2 hours, total cost, about $1.57 for Velcro and thread. 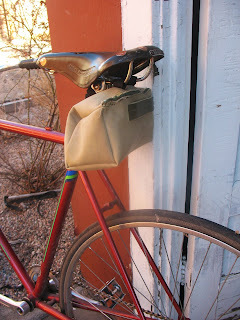 Here is a DIY pannier instruction set that someone has posted. For carrying the small stuff, maybe I.D., credit card, pump, patch kit, extra tube and your cellular phone I made this nifty little seat bag out of an old pair of canvas waders and an old zipper. Cost was $0.00, time spent was a bit more because sewing small items is more difficult for me, plus it was my first time sewing a zipper. If on-bike bags aren't your thing, messenger-style bags are the easiest of all to make. 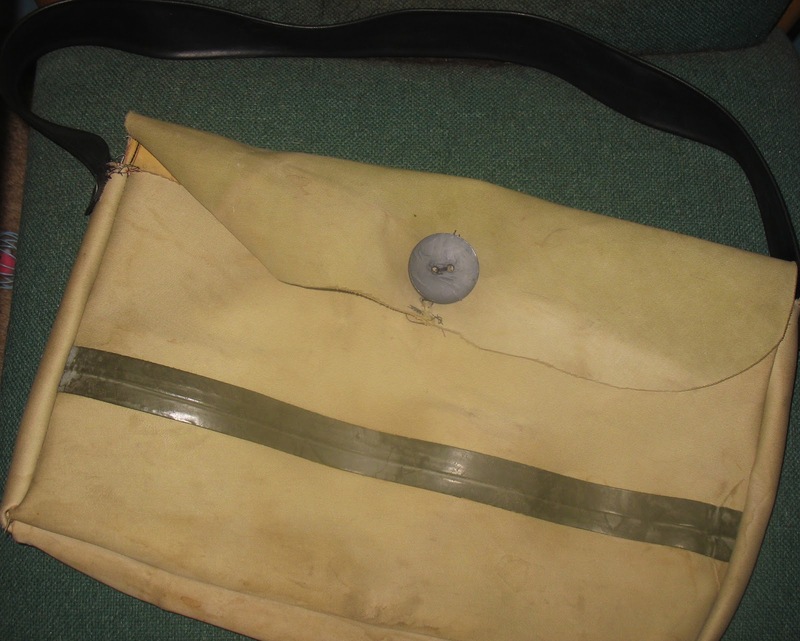 With the messenger bag, I continued the theme of re-using waterproof waders for the body, added a button, and used a thicker mountain bike tube for the strap. 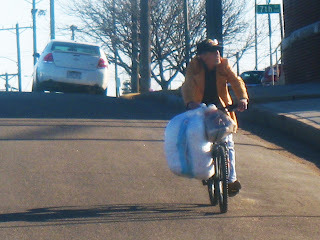 Riding with plastic bags strapped all over your bicycle is possible, but not the easiest. With a little creativity and effort, you can equip yourself with some inexpensive DIY gear that will make hauling your stuff from the store or work, much easier.